the Belly that runs on four feet. It was a thick voice--a muddy voice that would have made you shudder--a voice like something soft breaking in two. There was a quaver in it, a croak and a whine. A boatman turned where he sat on the gunwale, lifted up his hand, said something that was not a blessing, and the boats creaked on through the twilight. The broad Indian river, that looked more like a chain of little lakes than a stream, was as smooth as glass, reflecting the sandy-red sky in mid-channel, but splashed with patches of yellow and dusky purple near and under the low banks. Little creeks ran into the river in the wet season, but now their dry mouths hung clear above water-line. On the left shore, and almost under the railway bridge, stood a mud-and-brick and thatch-and-stick village, whose main street, full of cattle going back to their byres, ran straight to the river, and ended in a sort of rude brick pier-head, where people who wanted to wash could wade in step by step. That was the Ghaut of the village of Mugger-Ghaut. Night was falling fast over the fields of lentils and rice and cotton in the low-lying ground yearly flooded by the river; over the reeds that fringed the elbow of the bend, and the tangled jungle of the grazing-grounds behind the still reeds. 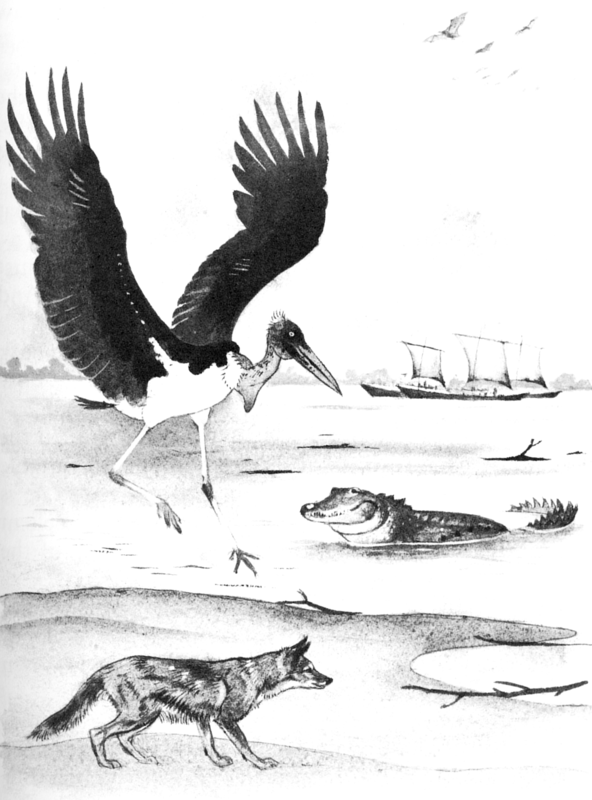 The parrots and crows, who had been chattering and shouting over their evening drink, had flown inland to roost, crossing the outgoing battalions of the flying-foxes; and cloud upon cloud of water-birds came whistling and ”honking” to the cover of the reed-beds. There were geese, barrel-headed and black-backed, teal, widgeon, mallard, and sheldrake, with curlews, and here and there a flamingo. A lumbering Adjutant-crane brought up the rear, flying as though each slow stroke would be his last. The Adjutant half turned his head, sheered a little in the direction of the voice, and landed stiffly on the sand-bar below the bridge. Then you saw what a ruffianly brute he really was. His back view was immensely respectable, for he stood nearly six feet high, and looked rather like a very proper bald-headed parson. In front it was different, for his Ally Sloper-like head and neck had not a feather to them, and there was a horrible raw-skin pouch on his neck under his chin--a hold-all for the things his pick-axe beak might steal. His legs were long and thin and skinny, but he moved them delicately, and looked at them with pride as he preened down his ashy-gray tail-feathers, glanced over the smooth of his shoulder, and stiffened into “Stand at attention”. 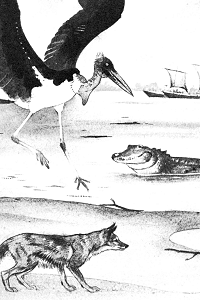 A mangy little Jackal, who had been yapping hungrily on a low bluff, cocked up his ears and tail, and scuttered across the shallows to join the Adjutant. He was the lowest of his caste--not that the best of jackals are good for much, but this one was peculiarly low, being half a beggar, half a criminal--a cleaner-up of village rubbish-heaps, desperately timid or wildly bold, everlastingly hungry, and full of cunning that never did him any good. “Ugh!” he said, shaking himself dolefully as he landed. “May the red mange destroy the dogs of this village! I have three bites for each flea upon me, and all because I looked--only looked, mark you--at an old shoe in a cow-byre. Can I eat mud?” He scratched himself under his left ear. “To hear is one thing; to know is another,” said the Jackal, who had a very fair knowledge of proverbs, picked up by listening to men round the village fires of an evening. “A liar, a flatterer, and a Jackal were all hatched out of the same egg,” said the Adjutant to nobody in particular; for he was rather a fine sort of a liar on his own account when he took the trouble. “When the Jackal owns he is gray, how black must the Jackal be!” muttered the Adjutant. He could not see what was coming. There was a soft grating sound, as though a boat had just touched in shoal water. The Jackal spun round quickly and faced (it is always best to face) the creature he had been talking about. It was a twenty-four-foot crocodile, cased in what looked like treble-riveted boiler-plate, studded and keeled and crested; the yellow points of his upper teeth just overhanging his beautifully fluted lower jaw. It was the blunt-nosed Mugger of Mugger-Ghaut, older than any man in the village, who had given his name to the village; the demon of the ford before the railway bridge, came--murderer, man-eater, and local fetish in one. 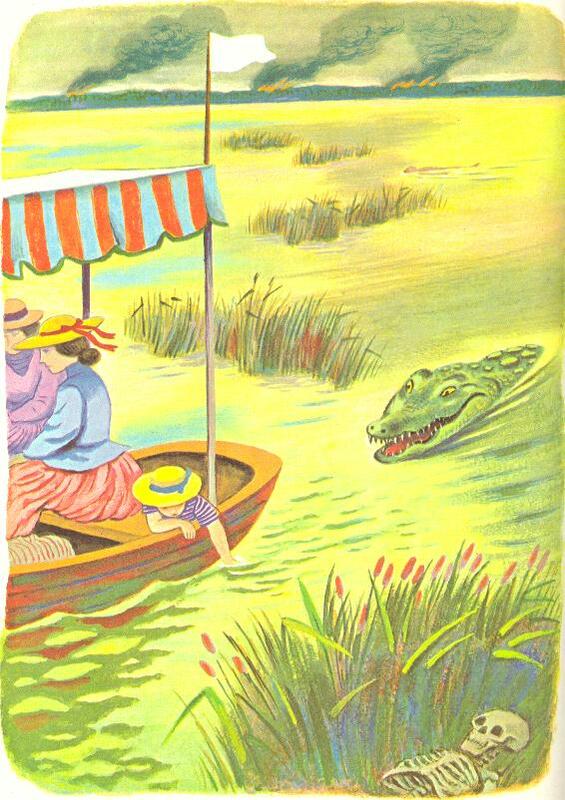 He lay with his chin in the shallows, keeping his place by an almost invisible rippling of his tail, and well the Jackal knew that one stroke of that same tail in the water would carry the Mugger up the bank with the rush of a steam-engine. Now the Jackal had spoken just to be listened to, for he knew flattery was the best way of getting things to eat, and the Mugger knew that the Jackal had spoken for this end, and the Jackal knew that the Mugger knew, and the Mugger knew that the Jackal knew that the Mugger knew, and so they were all very contented together. The old brute pushed and panted and grunted up the bank, mumbling, “Respect the aged and infirm!” and all the time his little eyes burned like coals under the heavy, horny eyelids on the top of his triangular head, as he shoved his bloated barrel-body along between his crutched legs. Then he settled down, and, accustomed as the Jackal was to his ways, he could not help starting, for the hundredth time, when he saw how exactly the Mugger imitated a log adrift on the bar. He had even taken pains to lie at the exact angle a naturally stranded log would make with the water, having regard to the current of the season at the time and place. 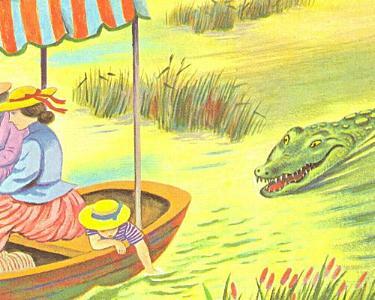 All this was only a matter of habit, of course, because the Mugger had come ashore for pleasure; but a crocodile is never quite full, and if the Jackal had been deceived by the likeness he would not have lived to philosophise over it. “Flattery is worse than an empty tin can in the belly. But that which we have just heard is wisdom,” said the Adjutant, bringing down one foot. “Consider, though, their ingratitude to this excellent one,” began the Jackal tenderly. “But surely I saw Marigold wreaths floating off the edge of the Ghaut only this noon,” said the Adjutant. Marigold wreaths are a sign of reverence all India over. “What good are marigold wreaths when one is on the rubbish-heap?” said the Jackal, hunting for fleas, but keeping one wary eye on his Protector of the Poor. “I have watched long--very long--nearly all my life, and my reward has been bites and blows,” said the Jackal. “Ho! ho! ho!” roared the Adjutant. There is one very unpleasant peculiarity about the Adjutant. At uncertain times he suffers from acute attacks of the fidgets or cramp in his legs, and though he is more virtuous to behold than any of the cranes, who are all immensely respectable, he flies off into wild, cripple-stilt war-dances, half opening his wings and bobbing his bald head up and down; while for reasons best known to himself he is very careful to time his worst attacks with his nastiest remarks. At the last word of his song he came to attention again, ten times adjutanter than before. The Jackal winced, though he was full three seasons old, but you cannot resent an insult from a person with a beak a yard long, and the power of driving it like a javelin. The Adjutant was a most notorious coward, but the Jackal was worse. “Once I heard that even the Protector of the Poor made a mistake,” said the Jackal viciously. “How good--how very good is goat!” said the Jackal. “Ay, I forgot. A channel divided them, and later dried up again,” said the Adjutant, who prided himself on his memory. “And did they do so?” said the Jackal, a little awe-stricken. This was hunting on a scale that impressed him. “Ah, noble sport! But what cleverness and great judgment it requires!” said the Jackal. “All are very good eating,” said the Adjutant, clattering his beak. “Now, of what use is that knowledge?” said the Jackal. “The river has shifted even in my little life.” Indian rivers are nearly always moving about in their beds, and will shift, sometimes, as much as two or three miles in a season, drowning the fields on one bank, and spreading good silt on the other. “Ah, I--glean--them,” said the Mugger. “There was a down-country jackal had it from a brother, who told me, that in Calcutta of the South all the jackals were as fat as otters in the Rains,” said the Jackal, his mouth watering at the bare thought of it. “Ah, but the white-faces are there--the English, and they bring dogs from somewhere down the river in boats--big fat dogs--to keep those same jackals lean,” said the Adjutant. “He has been as far as Delhi, and says all the people there walk on their heads,” muttered the Jackal. The Mugger opened his left eye, and looked keenly at the Adjutant. The Adjutant had done his very best to describe his feelings after swallowing a seven-pound lump of Wenham Lake ice, off an American ice-ship, in the days before Calcutta made her ice by machinery; but as he did not know what ice was, and as the Mugger and the Jackal knew rather less, the tale missed fire. There was a whistle overhead on the bridge, and the Delhi Mail slid across, all the carriages gleaming with light, and the shadows faithfully following along the river. It clanked away into the dark again; but the Mugger and the Jackal were so well used to it that they never turned their heads. “Is that anything less wonderful than a boat thrice the size of Mugger-Ghaut?” said the bird, looking up. “I saw that built, child. Stone by stone I saw the bridge-piers rise, and when the men fell off (they were wondrous sure-footed for the most part--but when they fell) I was ready. After the first pier was made they never thought to look down the stream for the body to burn. There, again, I saved much trouble. There was nothing strange in the building of the bridge,” said the Mugger. The Jackal looked at the Adjutant and the Adjutant looked at the Jackal. If there was one thing they were more certain of than another, it was that the engine was everything in the wide world except a bullock. The Jackal had watched it time and again from the aloe hedges by the side of the line, and the Adjutant had seen engines since the first locomotive ran in India. But the Mugger had only looked up at the thing from below, where the brass dome seemed rather like a bullock”s hump. “M--yes, a new kind of bullock,” the Mugger repeated ponderously, to make himself quite sure in his own mind; and “Certainly it is a bullock,” said the Jackal. “And again it might be--” began the Mugger pettishly. “Certainly--most certainly,” said the Jackal, without waiting for the other to finish. “Who hunts the white-faces?” yapped the Jackal excitedly. “I remember a little of that Hunting. I was young then,” said the Adjutant, clattering his beak significantly. “And what did they say?” the Jackal asked. “What food on the way?” said the Jackal, who kept his soul in his little stomach, and was not a bit impressed by the Mugger’s land travels. “That which I could find--cousin,” said the Mugger slowly, dragging each word. Now you do not call a man a cousin in India unless you think you can establish some kind of blood-relationship, and as it is only in old fairy-tales that the Mugger ever marries a jackal, the Jackal knew for what reason he had been suddenly lifted into the Mugger’s family circle. If they had been alone he would not have cared, but the Adjutant’s eyes twinkled with mirth at the ugly jest. “Assuredly, Father, I might have known,” said the Jackal. A mugger does not care to be called a father of jackals, and the Mugger of Mugger-Ghaut said as much--and a great deal more which there is no use in repeating here. “The Protector of the Poor has claimed kinship. How can I remember the precise degree? Moreover, we eat the same food. He has said it,” was the Jackal’s reply. That made matters rather worse, for what the Jackal hinted at was that the Mugger must have eaten his food on that land-march fresh and fresh every day, instead of keeping it by him till it was in a fit and proper condition, as every self-respecting mugger and most wild beasts do when they can. Indeed, one of the worst terms of contempt along the River-bed is “eater of fresh meat.” It is nearly as bad as calling a man a cannibal. “Were they better, then, than the big flood of last season?” said the Jackal. The Jackal, who had been growing more and more interested in the story, had just time to leap back as the huge tail swung by like a scythe. The Jackal waved his brush to show how completely everything was wiped out of his memory, and sat down with an air. “Was there still good food in the river?” said the Jackal. He turned stiffly, and shuffled to the top of the sand-bar, while the Jackal drew back with the Adjutant to the shelter of a tree stranded on the end nearest the railway bridge. The Jackal turned, whining impatiently, and was going to curl himself up under the tree-trunk, when suddenly he cowered, and looked up through the draggled branches at the bridge almost above his head. “What now?” said the Adjutant, opening his wings uneasily. “Men, is it? My office protects me. All India knows I am holy.” The Adjutant, being a first-class scavenger, is allowed to go where he pleases, and so this one never flinched. A shiny barrel glittered for a minute in the moonlight on the girders. The Mugger was lying on the sand-bar as still as his own shadow, his fore-feet spread out a little, his head dropped between them, snoring like a--mugger. There was a roar like the sound of a small cannon (the biggest sort of elephant-rifle is not very different from some artillery), and a double streak of flame, followed by the stinging crack of a Martini, whose long bullet makes nothing of a crocodile’s plates. But the explosive bullets did the work. One of them struck just behind the Mugger’s neck, a hand’s-breadth to the left of thle backbone, while the other burst a little lower down, at the beginning of the tail. 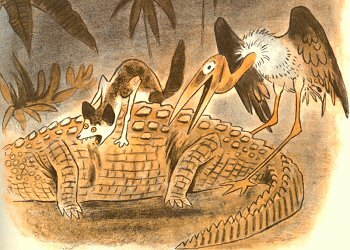 In ninety-nine cases out of a hundred a mortally-wounded crocodile can scramble to deep water and get away; but the Mugger of Mugger-Ghaut was literally broken into three pieces. He hardly moved his head before the life went out of him, and he lay as flat as the Jackal. The two Englishmen had hurried down from the bridge and across to the sand-bar, where they stood admiring the length of the Mugger. Then a native with an axe cut off the big head, and four men dragged it across the spit. Curiously enough, the Jackal and the Adjutant made the very same remark not three minutes after the men had left. 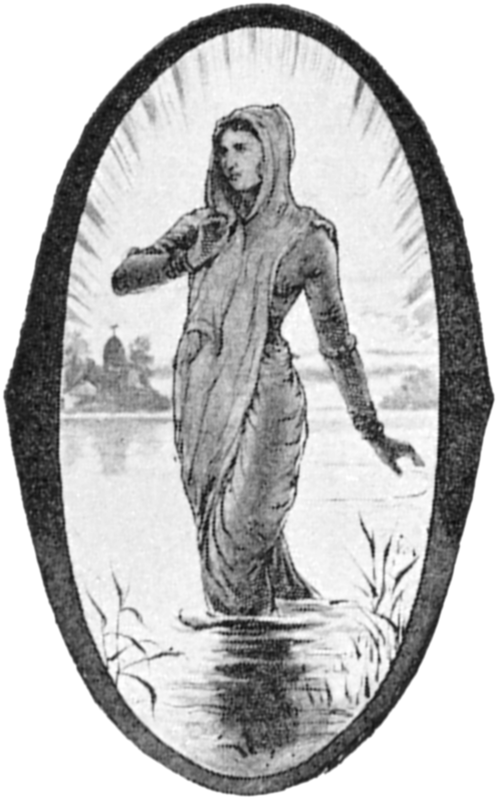 “Maiden, wait,” the ripple saith.